Gardeners’ Guild is obsessed with weather. Well – we are a landscape contracting company and we must adapt on a moment’s notice to rain, high winds and unseasonable heat or frost. We also stay on top of long term forecasting because our clients depend on us to help them manage their resources. I personally am obsessed with it. One, I need to since our San Francisco Bay Area readers are. And two, I find it fascinating. Our recent heavy rain seems to suggest a wet winter. Yes! More is predicted this weekend. Will our reservoirs be full by next spring? An article in the San Jose Mercury News and the most recent post on weatherwest.com has some indications based on weather forecast modeling. We are still officially in a drought, however. If you look at the map above you can see why. 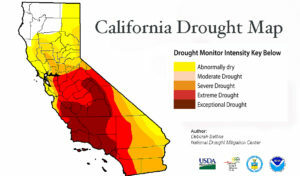 However, there are parts of the Bay Area that have been downgraded to just “abnormally dry”. These counties are Sonoma, Marin, San Francisco, San Mateo and Santa Cruz, Western Napa and Western Santa Clara. Unfortunately, Santa Clara County, as well as Contra Costa, Alameda, Solano, San Benito and Monterey remain officially in a drought. Water experts say that it would take a “very wet winter – all across the state – or perhaps two wet years – to end the drought statewide. Swain, in his last post, suggested that a La Niña was less likely. But his October article says we are “edging back to a La Niña-like” event. His evidence is cool water in the eastern Pacific and a warming trend for the tropical West Pacific. This, he says is linked to an unusually high pressure system. I wish could pass on better news. And, of course we don’t know for sure. That’s kind of frustrating. So continue rain dances, visualizing and we will continue offering advice on water conservation and irrigation that saves water. The California drought map shown above represents the state as of November 10th. (2016). But, the soil was dry and therefore the rain did not increase water levels as much as you would think.